Born in Middletown, New Hampshire on February 8, 1814, White was named after the famous British Admiral and hero of Cape Trafalgar. Before moving to Syracuse in 1843, he worked as a carpenter and a builder in Andover, Massachusetts. Upon arrival in Syracuse, White immediately made a name for himself, earning high praises as the building contractor for the Church of the Messiah. Following business reversals, White moved briefly to Brooklyn in 1847. In 1849 he set sail for San Francisco and worked in California during the 1849-1851 building boom and gold rush. In the early 1850's White returned to his wife and daughter in Syracuse, paid off his creditors and established what was to become a highly successful architectural practice. In 1856 White was given the prestigious opportunity of designing the new Onondaga County Courthouse in Clinton Square. The resulting design was hailed as a resounding success and elements from it were utilized in several of his subsequent plans, including the designs for the Jefferson and Cemung County Courthouses. White's reputation was growing as one of the best architects in Syracuse, a fact clearly evident in the sheer number of commissions he received. In 1867, White designed the original Onondaga Savings Bank (now the Gridley Building). White adapted this style to the Hall of Languages, the first building constructed on the campus of Syracuse University. White was engaged to design New York State armories in Syracuse, Dunkirk and Ballston Spa. 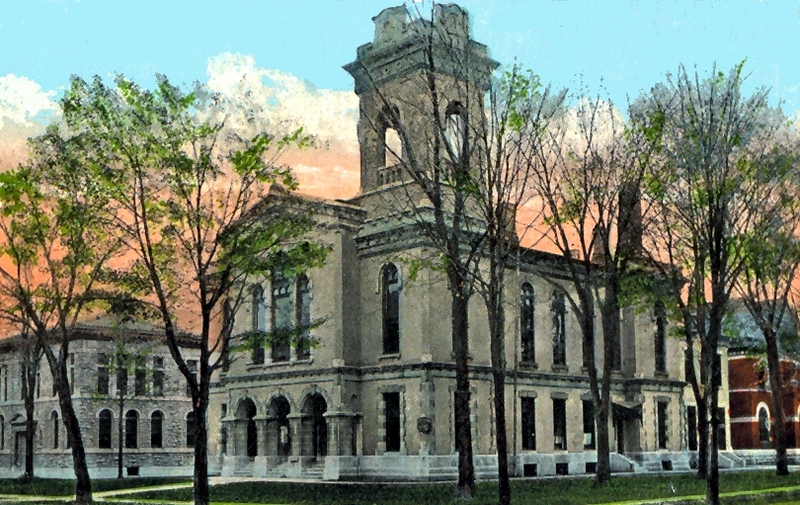 He also designed Plymouth Congregational Church in Syracuse. White prepared designs for over 100 churches. Although White undoubtedly designed many houses, the loss of his papers has obscured the identity of most of them. Accordingly, he is remembered mostly for his more monumental work. White's reputation remains to this day as one of the most distinguished architects to have been associated with Syracuse. White died in his home in 1892. His obituary referred to him as simply "the Venerable Architect". Source - The man who changed the face of Syracuse : Horatio Nelson White by Elinore Taylor Horning. Mexico, NY: E.T. Horning, c1988. Published in conjunction with an exhibit on his works at the Onondaga Historical Museum. Third Onondaga County Court House, Clinton Square, Syracuse, NY. Demolished 1970. Oswego county Courthouse, East Bridge Street, Oswego, NY. 1859. Extant. Chemung County Courthouse, Elmira, NY. 1861. Extant. Jefferson County Courthouse, 1865. Extant. The Wietung Building, Syracuse, NY. 1882. Hall of Languages, Syracuse University. 1873. Extant. Syracuse High School, West Genesee Street. 1869. The Church of the Messiah, Syracuse, NY. 1853. Plymouth Congregational Church, Syracuse, NY. Grace Episcopal Church, Syracuse, NY. 1877. Gridley Building (formerly Onondaga County Savings Bank), Clinton Square, Syracuse, NY. Extant.